between Edinburgh, Stirling, Perth and Glasgow. 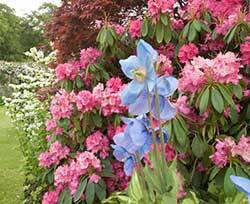 Surrounded by peaceful woodland, lawns, water gardens, herbaceous and rock gardens. Gill and Peter Hart welcome guests to stay for bed and breakfast at their home above the small village of Saline, and to enjoy their garden. 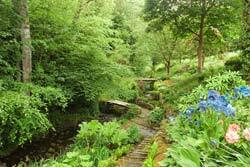 Over the past 26 years they have made 2 acres of gardens, herbaceous borders, a rockgarden and woodland gardens sloping down to a stream, with springs, an old well and two bridges. There's a further 20 acres of naturally regenerating woodland and the glen is designated a Site of Importance for Nature Conservation (SINC). So garden lovers will love to stay here, and Gill and Peter are very welcoming and friendly. Late Georgian with Gothic revival elements, Kirklands House was built on a slope above the small village of Saline in 1832. Saline has a shop, post office and a pub with a restaurant, and is under 40 minutes from both Edinburgh and Glasgow. Stirling and Perth are even closer, and so this is a perfect base for exploring central Scotland from east to west coasts. What better way to start the day than with a stroll through such a beautiful garden followed by a good breakfast? Below; Four images from the garden. 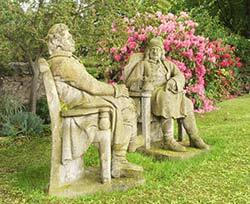 The original owner is thought to have bought the four statues of characters from Scottish poetry in the 1830's. The two shown here are of Tam o' Shanter and Souter Johnny enjoying a drink (from the poem by Robert Burns) by Robert Forest (1789-1852). 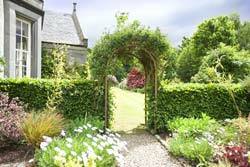 Rose arch to the lawn, borders and walled garden. ferns, gunnera, irises and poppies. Tam o' Shanter and Souter Johnny. 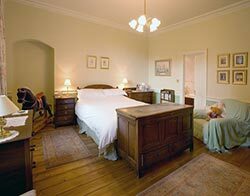 Above left; Twin bedroom with shower-room (right) en suite. 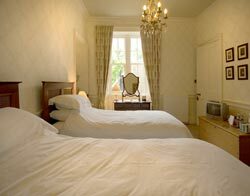 Above right; Double bedroom with bathroom en suite. There is separate shower as well as a bath with a shower attachment. (Both bedrooms have hairdryers, alarm clocks, etc). 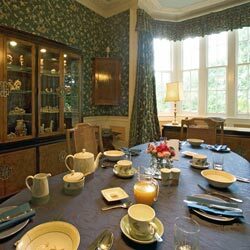 Guests are welcome to enjoy the comfortable Drawing Room which has a television, log fire in winter and a bay window that looks onto the garden. 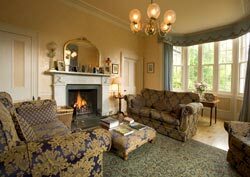 There is broadband internet access at Kirklands House. Where possible Scottish produce and local specialities such as Fifeshire bacon and sausages from Auchtertool. Also, local free range eggs (cooked how you like), freshly baked bread, and vegetarian options are available. Gill and Peter also offer an optional evening meal, but please give advance notice. When booking: 50% of your first night's stay. Up to two weeks before your stay: deposit refunded. Within 2 weeks: 50% of your first night's stay charged. Within 3 days : 100% of your first night's stay charged. From £35 depending on the time of year. 5-15 years 50% of the full rate. 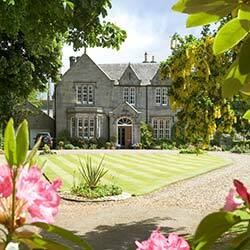 Please tell Gill and Peter you found Kirklands House through About Scotland!